Every now and then, all of us dream of taking that dream vacation somewhere far from hustle and bustle of the city to relax and escape from our stressful and toxic work environment. And part of taking that vacation is having a nice place to stay like a hotel or an inn. For most people, the mere mention of the world hotel would conjure images of luxurious accommodation, silk or linen sheets, posh interiors and excellent room services. But what if there are hotels wherein guests can not only experience excellent customer service and facilities but at the same time provides a one-of-a-kind experience not found in most hotels. To prove my point, here are 10 amazing hotel rooms all around the world that will certainly spice up your vacation. This hotel room sits high up in the trees and is made of a combination of different materials such as aluminum, wood and of course glass. The cube has 64 cubic meters of space and can accommodate two people. It also features a double bed, a small bathroom, a living room and a roof terrace. A transparent UV color is also laminated into the exterior glass panels in order to prevent birds from colliding with the reflective glass. Hotel de Glace is a hotel located 10 minutes from downtown Quebec City in Canada. This hotel features furniture and fixtures made out of ice. For overnight guests, an information session is held first in the Celsius Pavilion in order to inform them on how to avoid any surprises of discomfort during their stay. There are several suites and rooms in the hotel that offer various amenities including ice or snow sculptures, fireplaces and private spa. 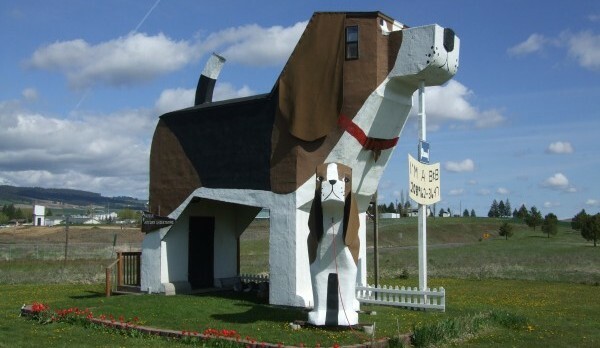 Located in Cottonwood Idaho, the Dog Bark Park Inn is an iconic symbol in the local neighborhood. The inn is shaped like a giant beagle and was designed and managed by local chainsaw artists Dennis Sullivan and Frances Conklin. The inn has two rooms that also feature dog-themed decorations and furniture. Other furnishings include queen-sized beds, full bath, microwave, small refrigerator and air-conditioning to name a few. Standard rates are set at $92/night which includes breakfast. Hotel Kakslauttanen (yes, we know it can be a mouthful) is located in the Saariselkä fell near Urho Kekkonen National Park in Finland. The hotel features several types of accommodation for guests that include 40 first-class log cabins and igloos made from snow. But the most interesting rooms in the hotel are its glass igloos. These glass igloos provide guests with the best opportunity to see the northern lights in actions as they lay in bed. As the name implies, the glass igloos are dome-shaped structures covered in glass. The Japanese, with their easy cook food and bullet trains are known to have a very fast-paced lifestyle. And their hotels are no exception. The capsule hotel is a type of hotel that features a number of extremely small-sized rooms or capsules intended to provide guests with a cheap, convenient and basic overnight accommodation. Unlike most hotels, Japanese capsule hotels don’t have the usual amenities like a bathroom or even tables and chairs. Instead, these type of hotels may only have a small bed and in some cases a small entertainment system (usually a TV). The Propeller Island City lodge is located in Berlin, Germany and features different themed rooms. Their gruft room to be specific caters to those who fancy the life of vampires as this room features two coffins that act as beds for guests. If sleeping in a coffin bed doesn’t suit you well, there’s a labyrinth below where another bed can be found. Standard rate for this room is set at 115 euros per night. For fans of Frodo and the Lord of the Rings franchise, you might want to stop by the Hobbit Motel next time you plan a trip to New Zealand. Located in Woodlyn Park in Waitomo, the Hobbit motel has the exterior design of houses found in the fictional village of “The Shire”. Comfort wise, the two rooms in the motel are all self-contained with each room having its own kitchen and bathroom. Also, each room can accommodate up to 6 guests and are built from polystyrene blocks that provide added warmth during the winter and provides a cooling effect in summer. Another budget hotel similar to Japan’s capsule hotels is found in Austria. Rooms in the Das Park hotel are made out of standard sewer pipes. The pipes have an inner diameter of 2m and a length of 2.6 meters. Guests are treated with foam double size bed. Ample storage space is provided beneath and beside the bed and a 220-volt power outlet is provided for charging cellphones, digital cameras and other electronic devices. For those who want a different kind of European adventure, the Karosta Prison Hotel in Latvia may be your best bet for the most unique hotel experience this side of the planet. The hotel was once a working prison for most of the 20th century but was later converted into a museum, hotel and tourist attraction. To maximize the experience, the hotel offers guest amenities and activities worthy of any inmate. Guests sleep in bunks and are given prison meals. There are also guided tours that showcase special programs based on the real lives of prisoners. Poseidon resort is the first resort in the world to have an underwater complex of rooms and amenities. Named after the Greek god of the seas, the resort’s 24 underwater suites are submerged in 40 feet of sea water in a lagoon off the coast of Fiji. The suites are equipped with the highest quality materials and furnishings including marble, leather and expensive fabrics. 70% of the room is enveloped by 4-inches of acrylic which provides guests with an amazing view of the sea floor lined with individual corals and schools of fishes. There you have it guys. If you’re planning to get a vacation sometime in the future, you might want to consider these 10 resorts to make the most out of your trip. If you have other hotel recommendations, please tell us by leaving a comment below. You can also hit us up on Facebook, Twitter and Google+. Lastly, don’t forget to subscribe to our blog to get more inspirational and informational articles from our highly skilled team of creatives.